Earwigs are elongated, flattened insects, that may be light red-brown to black in color. They are easily recognized by their forceps-like appendages on the end of the abdomen. The size and shape vary between species and between males and females. These insects have chewing mouthparts and long, slender antennae and are either winged or wingless. If wings are present, the first pair are hard and very short, barely covering the first segments of the insect's abdomen. There are two common species of earwigs found in North Carolina. The European earwig is about 1/2 to 3/4 inch long, with banded legs and reddish head. The ringlegged earwig ranges from 1/2 to 3/5 inch long and is black-yellowish underneath with legs having dark crossbands. Young earwigs (nymphs) are similar to adults and will have a white to olive-green appearance and do not have wings. Earwigs get their name from a European superstition that these insects enter the ears of a sleeping person and bore into the brain. During the spring or autumn, the female earwig lays 20 to 50 smooth, oval, white or cream-colored eggs in a chamber in the upper 2-3 inches of soil. Earwigs are somewhat unusual (among insects) in that the female cares for the eggs and for newly hatched nymphs (immatures) until they molt for the first time. The nymphs leave the nest and spend one season maturing. Both eggs and adults overwinter in the soil below the frostline to escape the cold temperatures. Earwigs rarely fly and can move about readily but often hitchhike in laundry baskets, cut flowers, luggage, newspapers, carboard boxes, lumber, baskets of fruits and vegetables, automobiles, etc. They require moist, cool places and are usually found in damp crawl spaces or basements, flower gardens near the home, in mulches, compost piles, trash, under boards and in wood piles. 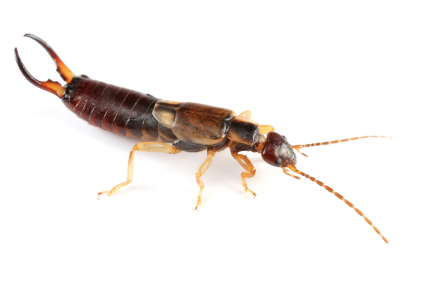 During dry, hot weather, earwigs sometimes migrate indoors. They are active primarily at night and are often found around lights. They feed on mosses, lichens, algae, fungi, insects, spiders and mites, both dead and alive. Some earwigs are predators, feeding on aphids, while others feed on living plants and may become pests in greenhouses and on certain crops such as vegetables, fruits, ornamentals, forages and field plants.